Chances are, if Madeline Schnorr and April Thomson hadn’t dashed together across Wayne State’s campus in a torrential rainstorm in fall 2014, they might never have discovered the mutual love of stage set design that cemented their relationship. That fateful afternoon, Schnorr and Thomson attended an orientation session in Old Main and just happened to sit next to each other. They discovered they both lived in the Towers Residential Suites and headed back there after their meeting ended. But they did learn enough about each other in that short time to know that they were both pursuing similar career paths. Schnorr, a native of Marshall, Michigan, came to Wayne State after attending Kellogg Community College in Battle Creek, Michigan, for two years. She was attracted to Wayne State’s robust theatre program and quickly immersed herself in work that included scenic design for Wayne State's production of Alice in Wonderland and for the university’s summer touring children's production of The True Story of the Three Little Pigs. Thomson kept busy studying for her B.F.A. in technical theatre/theatre design and technology, which she eventually earned with honors. During her time at Wayne State, she served as scenic designer for A Streetcar Named Desire (Hilberry Theatre) and props designer for Alice in Wonderland (Bonstelle Theatre) and Twelfth Night (Hilberry Theatre). Thomson and Schnorr kept in sporadic long-distance contact during the 2017-18 academic year. Schnorr had moved to Kalamazoo and was busy with her internship, and Thomson was busy finishing her degree. 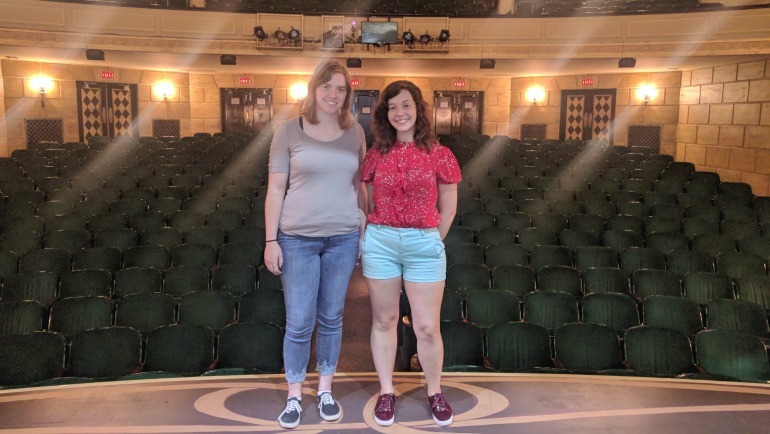 So starting last June, the two began working together on set design in preparation for the Kalamazoo Civic Theatre’s full slate of productions. In July, they read in the local paper that Wayne State President M. Roy Wilson was coming to Marshall on the first stop of his second annual Road Warrior bike tour. They made a plan to attend the reception Wilson hosted at the Dark Horse Brewery and brought along their friend, Taylor Blad, who was at the time considering where to go to college. “We thought President Wilson’s talk at the reception was outstanding, and really laid out the reasons why a Wayne State degree has more value than it ever has,” Schnorr said. For now, Schnorr and Thomson are working together again, doing something they love, and honing a craft that was first nurtured at Wayne State University.